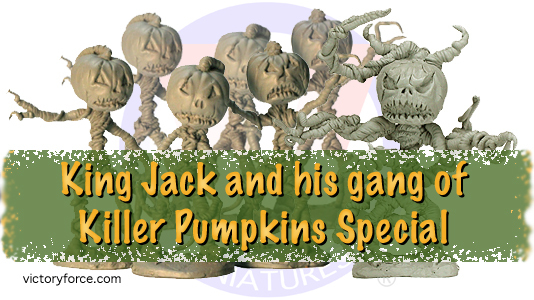 Get King Jack and Six of his evil pumpkin kin for one special price. Find in the Specials Section of the Victory Store. Don’t forget to look at the Storybook Wars Section for these evil pumpkins allies the Knotty Trees and Ol’ Dry Rot. Special subject to end without notice and is not part of any coupon deals. This entry was posted in General News, VFM Specials. Bookmark the permalink.